Navagraha Chandra or moon is reflection of Sun and its position is of great importance in birth chart or horoscope. It is considered as the queen of the Navagrahas and it rules the mind as per Hindu astrology. The moon creates generous and charitable persons. It plays an important role in the janam kundali of a person. Moon also has influence over the 28 cycle of ovulation in women. Chandra governs chest, eyes (right eyes for ladies and left eye for men), throat, voice, veins, and kidneys. Chandra is considered maternal which governs relationship with our mother, their health and maternal relatives. Chandra also has influence on intelligence, fixed assets, maturity, emotions, wealth, travels, fame and name, looks, governmental favors, respect and sleep. If Chandra is not well placed in one’s birth chart the person will suffer from lung diseases such as colds, sinuses, asthma, tuberculosis, womb, skin, depression, mood swings and other mental related diseases. The day in a week associated with Chandra is Monday. It also stays approximately for 2.25 days in a Rashi or astrological sign. 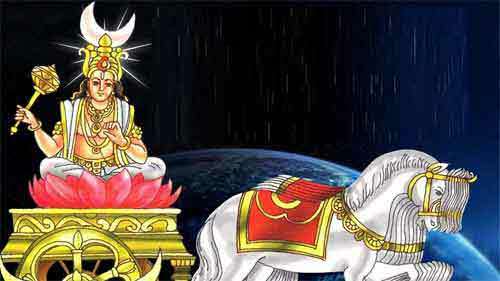 The ideal way to overcome Chandra Graha dosha or problems related to moon in birth chart is through worship of Shiva.